Q4 is set to begin next week, and that means a brand new set of 5% bonus categories for the Chase Freedom card. 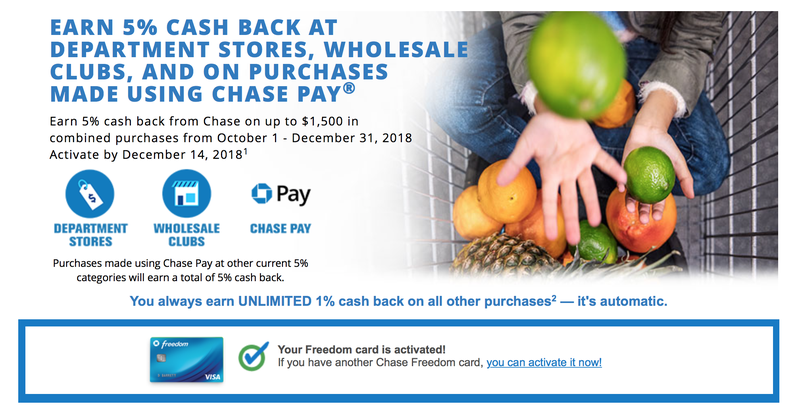 Starting in October (and once you activate the bonus here), you’ll earn 5% back on Chase Freedom purchases at department stores, wholesale clubs, and on any purchase made with the Chase Pay app. As always, you can move those points into your Chase Sapphire Preferred or Reserve account to convert them into Ultimate Rewards points, which are much more valuable than regular cash back. Holiday shopping season is the one time of year this category piques my interest, and even then, it’s far from my favorite. But still, at least you have a wide variety of options, and the bonus will work whether you buy in store or online. You can bet that all of these stores will have big sales around the holidays, so keep your eyes open for earning opportunities. No surprises here: You’ll earn 5% back at Costco, Sam’s Club, and BJ’s, both in store and online. Just note that you will not earn bonus points on fuel purchases from these stores. We’ve seen Chase Pay included as part of broader “Mobile Wallet” categories for the Chase Freedom before, but this time around, it’s your only such option. Chase Pay is a QR code-based point of sale payment app, making it less convenient and widespread than NFC-based solutions like Apple Pay, and thus much harder to remember to use. You will, however, find it at some major retailers and restaurants like Best Buy, Five Guys, and Cinemark theaters, and you can even use it online at Walmart.com. That said, you can use it to pay for gas from your phone at (mostly Shell) gas stations, and even order food directly through the app at a variety of restaurants. Some utility companies even let you set up Chase Pay as your autopay account, which is a quick way to rack up a ton of points. I suggest adding the app to your main home screen (sacred real estate, I know) to help get you into the habit of using it. Just be sure you’re using the Freedom card through the app, as you won’t get bonus points if you use any other card.